hats, originally uploaded by jahansell. 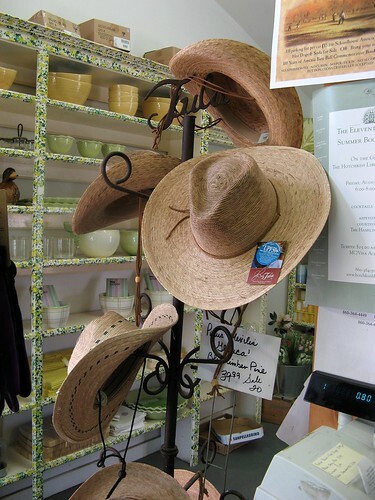 Paley's sells a lovely collection of gardening hats. All shapes and sizes - there's one meant for you! Hihi Jenny, how are u? Just pop in to say hi and have a quick tour of Sharon. Have a great summer! hehe i have a hat like that. its just its smaller. bought it last summer in boracay. Nice photo, Jenny. I like straw hats and I remember buying a new cowboy type hat in 1952 and was shown how to mold the brim. Soak in water and put out to dry in the hot, Tucson, Arizona sun. Once dry the brim was set for life and stayed that way. I assume you can do that with these garden hats too. I sure could use one of these! nice shot!